Lock Timesheet feature is located in the upper right corner of the timesheet report page. Only the owner can use this feature. 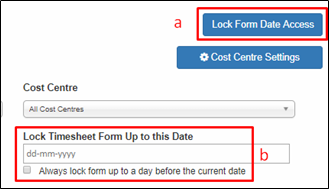 To use this function, you just need to choose users who will be allowed to lock the timesheet form. 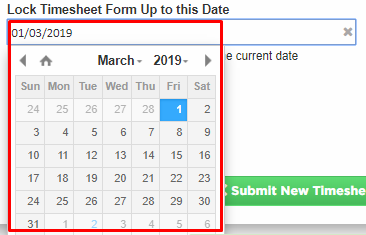 Users listed here will now have Lock Timesheet Form Up to this Date field on their report and will be able to lock timesheets. This part specifies up to what date are the timesheets locked to your employees. When a timesheet is locked, it means that an employee can no longer submit a timesheet on or before the specified date. 2.1 Specify the date you want the timesheets to be locked. Click on the field then choose a date. Changes are automatically saved. 2.2 Ticking the checkbox will lock the timesheet except for the current date. Example: The current date is April 2, 2019. All timesheets submitted until April 1 will be locked. Employees can no longer submit and update the timesheets up to this date - April 1. 2.3 To unlock timesheets, you must click on the X button beside the date to clear the field. If there is no specified date on your lock timesheet feature, your timesheets are automatically unlocked for all the dates.